On the 23rd (Thu), take a stroll through Basavanagudi, then contemplate in the serene atmosphere at Ragigudda Sri Prasanna Anjaneyaswamy Temple, then take in the spiritual surroundings of Dodda Ganapathi Temple, and finally get curious at Visvesvaraya Industrial and Technological Museum. To see other places to visit, where to stay, more things to do, and more tourist information, read Bengaluru trip planner . If you are flying in from India, the closest major airport is Kempegowda International Airport. In May in Bengaluru, expect temperatures between 39°C during the day and 26°C at night. Finish your sightseeing early on the 23rd (Thu) so you can travel to Bangkok. 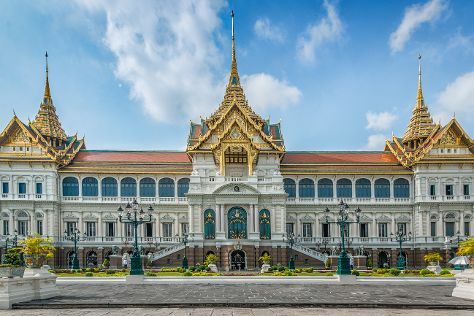 On the 24th (Fri), explore the historical opulence of The Grand Palace, then delve into the distant past at Wat Pho, then contemplate in the serene atmosphere at Temple of Dawn (Wat Arun), and finally take in the spiritual surroundings of Wat Saket. On the 25th (Sat), you'll have a packed day of sightseeing: get a taste of the local shopping with Chatuchak Weekend Market, then get a dose of the wild on SEA LIFE Bangkok Ocean World, and then admire the striking features of Jim Thompson House. To find out how to plan a trip to Bangkok, use our trip itinerary maker. You can fly from Bengaluru to Bangkok in 7.5 hours. Another option is to drive. The time zone difference moving from India Standard Time (IST) to Indochina Time (ICT) is 1 hour. Traveling from Bengaluru in May, Bangkok is somewhat warmer at night with lows of 32°C. Finish up your sightseeing early on the 25th (Sat) so you can travel to Ko Phi Phi Don. Kick off your visit on the 26th (Sun): make a trip to Koh Phi Phi Viewpoint, then cool off at Aquaride, then enjoy the sand and surf at Long Beach, and finally explore the activities along Maya Bay. Get ready for a full day of sightseeing on the next day: discover the deep blue sea with a scuba or snorkeling tour, kick back and relax at Nui Beach, and then kick back and relax at Laem Tong Bay. To plan Ko Phi Phi Don vacation without wasting time, ask Inspirock to design an itinerary. You can do a combination of flight, bus, and ferry from Bangkok to Ko Phi Phi Don in 7.5 hours. Other options are to do a combination of flight, shuttle, and ferry; or take a bus. Expect little chillier temperatures when traveling from Bangkok in May; daily highs in Ko Phi Phi Don reach 38°C and lows reach 28°C. 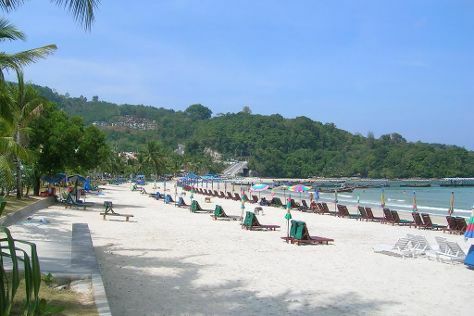 Cap off your sightseeing on the 27th (Mon) early enough to travel to Patong. On the 28th (Tue), stroll through Karon Beach, then enjoy the sand and surf at Patong Beach, and then have some family-friendly fun at The Kids Club Phuket. Get ready for a full day of sightseeing on the next day: take a tour by water with Boat Tours & Water Sports. To find traveler tips, other places to visit, and tourist information, you can read our Patong travel route planner. Traveling by combination of ferry and taxi from Ko Phi Phi Don to Patong takes 2.5 hours. Alternatively, you can ride a ferry. Expect a daytime high around 38°C in May, and nighttime lows around 28°C. Wrap up your sightseeing by early afternoon on the 29th (Wed) to allow time for travel back home.